Fortnite is more than a game – it’s a global phenomenon. Not many titles in recent years have merited their own clothing range or kept England footballers glued to their screens after training. The popularity of the survival game, with its tense Battle Royale format, has grown and grown over time. It now has 200 million registered players worldwide – last January it had 40 million players. But despite being a global hit, Fortnite has never topped the UK charts. That’s simply because the game itself is free. There are no physical sales – on which the current charts are based – to record. And the industry is still using units rather than revenue to measure a game’s success. 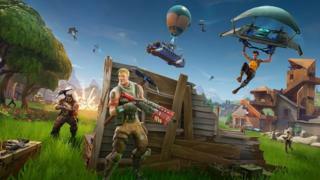 While the launch of a new season of the game has become a regular event, the idea of having lots of updates and downloadable content – meaning the experience of the game is ever-evolving – is not unique to Fortnite. In fact, the days where the game that came in the box is the same one you’re playing weeks, months or even years later are long gone. Instead, they are increasingly seen as a service rather than a product. While Fortnite is perhaps the most successful example of it to date, other major releases like Call of Duty and Fifa are following the same script. In the UK in 2017, gamers spent £2.67bn on digital, mobile and online products including in-game purchases. In comparison, they spent £790m on box software – physical games used in consoles. It is this second category on which the charts are based. Epic Games, the company that owns Fortnite, is tight-lipped about how much it makes from the game. Bloomberg has estimated that the whole company, with all its products, is worth between £3.9-6.2bn ($5-8bn). The industry faces challenges when it comes to regulation, too, as the laws and guidelines have to keep up with the fast-evolving world of gaming. The Gambling Commission has raised concerns that in some instances the worlds of online gaming and gambling could become blurred. It has highlighted “unlicensed third-party websites offering illegal gambling linked to popular video games,” where players can stake a bet on things like the value of their virtual weapons inventory. A study conducted by gambling psychology researchers at the University of Adelaide in Australia found online gaming’s system of “microtransactions” closes the gap between gaming and gambling, and may pose a risk for vulnerable players. In September, the World Health Organization added a definition of gaming disorder to its latest edition of the International Classification of Diseases. On top of this, some parents have been caught out by their children unwittingly making large purchases on their credit cards. A Fortnite spokesperson pointed out that most consoles do have the option to set a spending limit (which can include zero) as well as age restrictions. And anyone concerned about interactions with other players can switch off the chat function in-game, as well as on the console itself. As well as the regulators, the wider gaming industry itself has had to evolve to keep up with the latest innovations. While it has traditionally been dominated by major titles that are developed by hundreds of people, cost millions to make and at least £50 to buy, games like Fortnite have lower up-front costs and are free. By keeping players engaged with in-game purchasing and frequent updates, they can make a company a lot of money. Meanwhile, the latest estimates from the Department for Digital, Culture, Media and Sport suggest that jobs across the wider computer games sector more than doubled between 2011 and 2017, from 13,000 to 30,000. In Fortnite’s seventh season, which is released on Thursday, players can expect more costume additions, map changes and plenty of snow. These might seem like small adjustments but, by adding more content, tweaking the game map and updating what players can see and experience, developers are trying to give audiences a reason to keep coming back.